Interleukins are soluble messengers that allow immune cells to communicate. Interleukin-33 (IL-33) is a member of the IL-1 family that has been discovered in 2003 by Jean-Philippe Girard’s team (DR1, Inserm) at the Institute of Pharmacology and Structural Biology. IL-33 is constitutively expressed in blood vessels and in epithelial barrier tissues exposed to the environment (lung, skin or digestive tract). It is released as an active full length protein upon cellular damage and may act as a potent alarm signal to alert cells of the immune system after tissue injury or infection. Jean-Philippe Girard’s team has now discovered an important mechanism involved in the regulation of IL-33. The researchers found that IL-33 can be cleaved by proteases released from neutrophils, white blood cells that are rapidly recruited to the sites of tissue injury. The IL-33 fragments generated by these proteases were identified precisely and they were found to exhibit a ten times greater potency than the full length protein for the activation of immune cells ! IL-33 is involved in various inflammatory and allergic diseases including asthma, rheumatoid arthritis, inflammatory bowel diseases, and cardiovascular diseases. No doubt that the discovery of super-active forms of IL-33 is of major importance for understanding the action of this protein during inflammation. These novel forms of IL-33 may be used as novel therapeutic targets for inflammatory diseases. 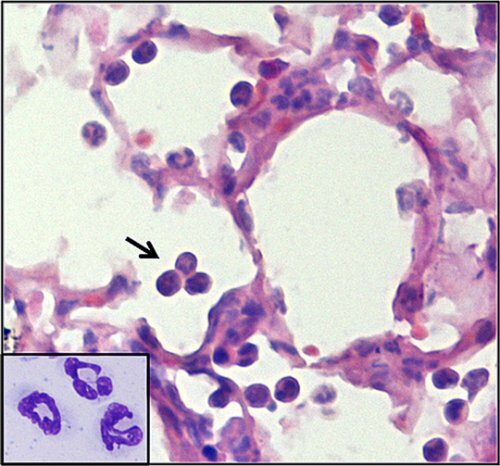 Visualization on tissue section (arrow) or broncho-alveolar lavage (boxed) of neutrophils recruited in the lung fduring inflammation. These inflammatory cells, recognizable to their poly-lobulated nucleus, release enzymes able to increase the activity of IL-33.